﻿ Adaline Hotel & Suite, Da Nang | FROM $26 - SAVE ON AGODA! "The room was very clean and th staff were super welcoming!" Have a question for Adaline Hotel & Suite? "The staff is helpful, thoughtful and attentive (bar manager and the brunch staff)." "Our hotel is very near the beach, just cross the street." 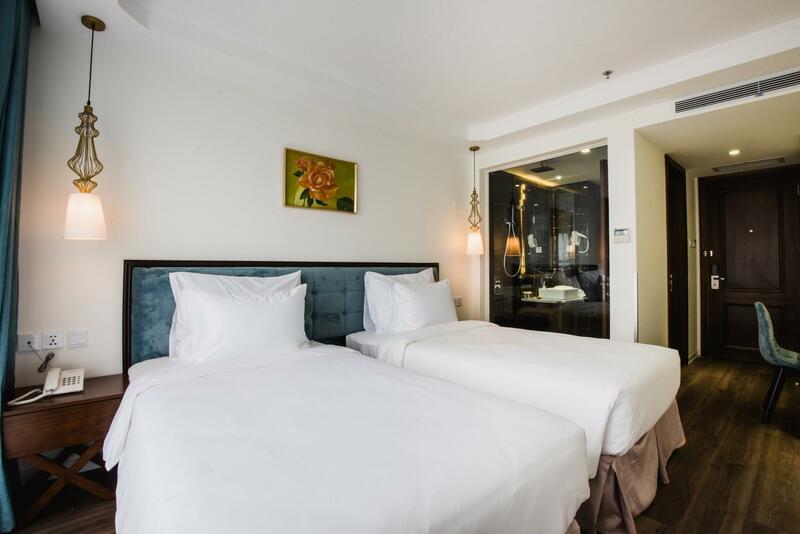 Adaline Hotel & Suite, located in Phuoc My, Da Nang, is a popular choice for travelers. From here, guests can enjoy easy access to all that the lively city has to offer. With its convenient location, the hotel offers easy access to the city's must-see destinations. At Adaline Hotel & Suite, the excellent service and superior facilities make for an unforgettable stay. 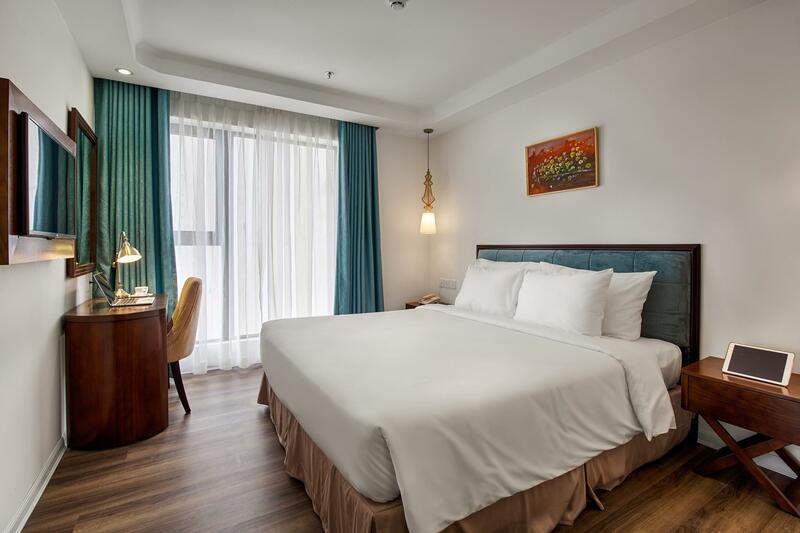 Top features of the hotel include 24-hour room service, free Wi-Fi in all rooms, 24-hour security, daily housekeeping, taxi service. Hotel accommodations have been carefully appointed to the highest degree of comfort and convenience. 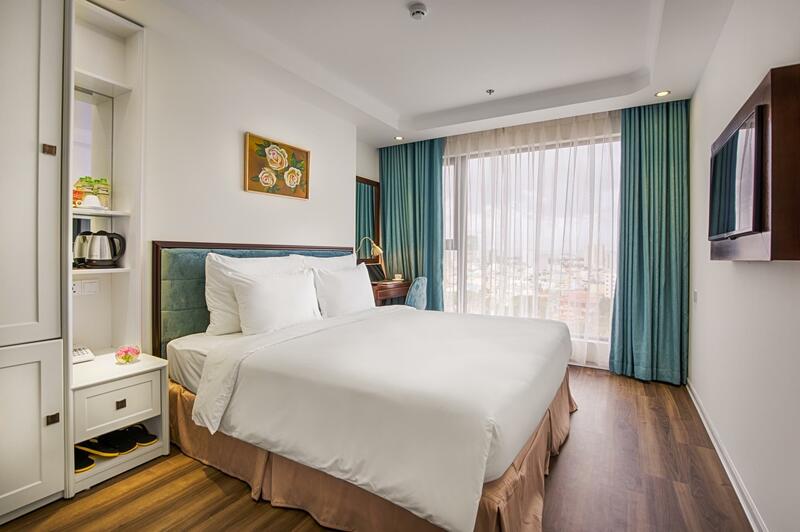 In some of the rooms, guests can find television LCD/plasma screen, complimentary instant coffee, complimentary tea, free welcome drink, linens. The hotel offers many unique recreational opportunities such as hot tub, outdoor pool. 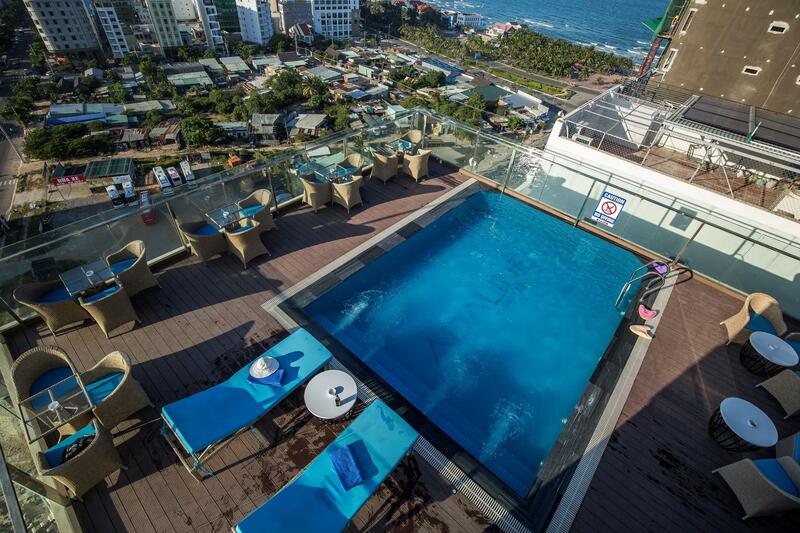 Whatever your reason for visiting Da Nang, the Adaline Hotel & Suite is the perfect venue for an exhilarating and exciting break away. "Breakfast is very good, lots of choices - salad, bread, omel..."
I prefer the city side far more than being near My Khe beach. As a southern california native, I have access to many amazing beaches so being beachside isn't really a big thrill to me. Plus, the beaches in da nang are just meh. I've traveled to many places and there are far better beaches out there. This place isn't exactly ON the beach either (and it's priced that way). The second reason i wouldn't recommend this place is that it's got paper thin walls. A lot of boutique hotels suffer from this, but being as it's close to the beach you get more loud tourists. I'm in my late 30s and I don't need to be in this type of environment. The room is also a bit small and the water pressure is just so-so. But if you're looking for value that's close to the beach and you don't intend on sleeping until later, then this place is not bad. Near to beach, small but decent. Fit 3 person in a room with double bed and single. Good choice for short trip. Staff very friendly and helpful. Despite there is language barrier but they try to help as much as possible. Amazing hospitality. Rooms were very clean, bathroom made me feel like royalty. Roof top pool was beautiful. After staying in hostels for 2 weeks this place was a much needed break. Everything very close and all staff were very helpful. I stayed here based on the recommendation of a friend who has stayed here before. The location is good, the room was decent. Upon checking in, my toilet didn’t flush and my shower ran out of hot water in 2 minutes. Luckily both issues were quickly resolved, however. Least favorite part was probably the breakfast -had it 3 times and was only adequately satisfied each time. A few strange items and they didn’t serve REAL BACON. Pool area is quite small and doesn’t have a great view of the water, but I rarely spent time up there. Overall, a solid but not amazing hotel, decent value for the money. This hotel is located just 10min away from My Khe Beach, at the city center with lots of local shop/restaurant nearby. The breakfast spread is very good and we enjoyed throughout our stay. Staff are helpful in many ways. Hotel's car rental service offers very reasonable price too. Very much recommended. Breakfast are best and good quality. Room is clean. Very nice hotel (best value for money hotel I've stayed at) On the negative side :- shower stall in room 901 leaked due to the seal were the glass joins the wall has failed causing the floor to flood,this was also the case in my companions rooms !On the occasions that I went for breakfast before 7am there was no bread or cereals available requiring me to return later (very annoying) the food in the stainless containers was cold (made the day before maybe ?) Cold potatoes wedges (disgusting) They must learn to cater for Europeans ! They don't like you to make brown toast !! They turn down the toaster in front of you !! 鄰近美溪沙灘、性價比高的精品酒店 Near My Khe beach, good value for money. Room is clean, size is not big but enough, but shower is too weak. Breakfast is very good, lots of choices - salad, bread, omelet, Vietnamese cakes, Vietnamese style rice noodles, etc. Price for private car booking to Bana Hills, Hoi An is good, a little bit cheaper than the Grab price. My family of five (three children) stayed at the Adeline Hotel for three days. The staff is helpful, thoughtful and attentive (bar manager and the brunch staff). 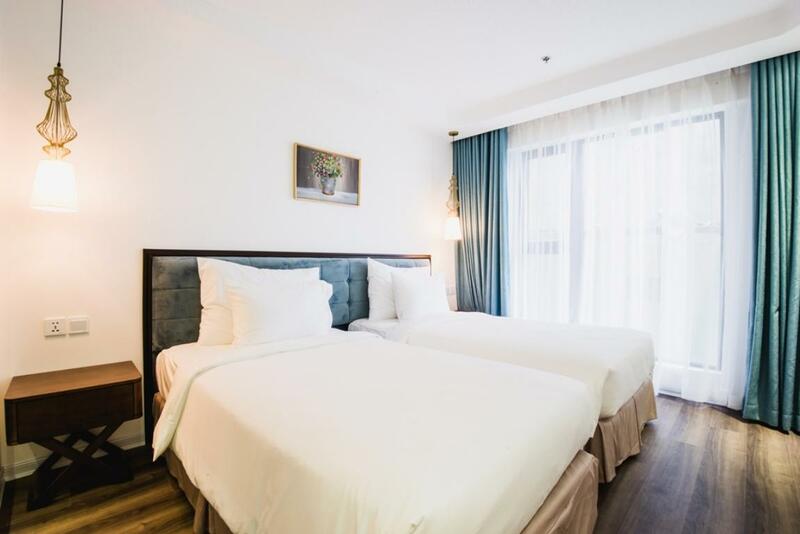 This hotel enjoys a great location—walking distance to My Khe Beach, great local restaurants (especially Indian food) and less than 6km to Danang airport and the Danang Railway station. The pool and bar were great with city views. We really enjoyed a different decor style after our Indochina hotel decors in Hoi An and Hue. The breakfast buffet is wonderful and plentiful. There are two convenience marts a few doors down from the hotel so you can pick up small snacks and drinks. The beds were very comfortable and we enjoyed the views from our room. When we did not run the AC, there was a strange smell. The only other negative issue was the shower because water could spill outside the curtain area but not a big issue. Our safe and the safe in our sons room were broken. I would definitely stay here again. 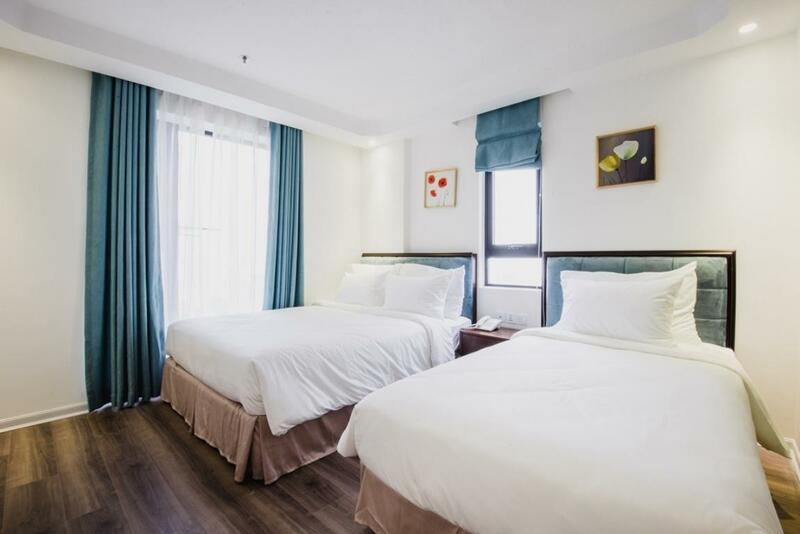 Pros : Friendly and helpful staff, beautiful and clean room. 5Min walk to the beach. Cons : Soundproofing of the room isn't so good. I could hear the guests staying beside our room, they were having some sort of party. The bathroom is quite old and dirty, the water stucked and flooded in bathroom when showering. The breakfast is nice. I stayed 3 nights in Adeline and the breakfast is changing everyday. Clean room, Nice view, friendly staff. Walk to my khe beach within two minutes and 2 convenience store around but far away from town area. Very clean and comfortable rooms. Rooftop pool with bar area excellent. Beautiful view of city and ocean. Beach only a 5 minute walk. Dragon Bridge a 25 minute walk. Counter staff should be able to recommend traveler the places to eat, visit and convenient store around the vicinity. Should recommend hop on & hop off services available.